What a great team and office.Denise P.
Dr. Soondar is great! Very good bedside manner and gives you several options for treatment!Bill H.
When you come to see us, we want you to be comfortable from the very start. Our doctors, office staff and patients work together as equal partners to deliver the kind of medical attention many health care offices just don’t have time for. How are we different? Our number one goal is to help each patient find physical relief as quickly as possible and get back to living a normal life. We believe our patients deserve information. Our goal is to educate each patient and begin a treatment program with the highest quality of care available. We have helped people from all walks of life, of all ages and with all kinds of problems. We keep you in the game. This slogan sums up our busy sports injury practice. We have helped many patients who play organized sports, run, jog, and swim get back to doing the things they love. Many of our patients are high level, amateur, professional, and collegiate athletes. We work as a team with you and your other doctors to give you the best possible care. Our coordinated care approach allows us to closely monitor your related health conditions and develop the best treatment for you as an individual. Our reputation is solid. We have a history of established distinction serving the Philadelphia Tri-State area. At Healthmark, we pride ourselves on our up-to-date, cutting edge treatment and surgical options. Our foot and ankle specialists keep abreast of every medical advancement in foot and ankle ailments and apply the latest technology to your care. Your enjoyment of life and all it has to offer can be seriously disrupted by foot and ankle conditions. Yet too many people wait to see a foot and ankle specialist, hoping their pain will go away on its own. Unfortunately, this waiting can allow your condition to worsen, becoming something much more serious than it would have been with earlier treatment. Skin Cancer of the Lower Extremities: Are You at Risk? Learn about the common causes of skin cancer, risk factors, different types of cancer, how skin cancer is diagnosed, and more in this free report. Our society eats more and exercises less. The consequence? Metabolic syndrome. 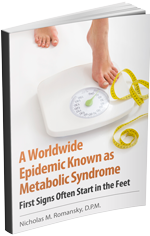 If you think you could be suffering from metabolic syndrome, you need to read this report. It covers the signs often found in the feet and how to address it. The Foot is Not an Island ! 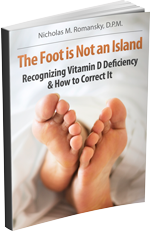 Vitamin D deficiency has gotten a lot of attention in recent years and for good reason. To find out if you are deficient, order your free copy of our report.